POVCOMP 2004: Viewing Page for "Model Expo Entry"
A 1/4 scale model of a WW1 Bently BR2 rotary engine for a model expo entry. This image shows a one quarter scale mode of a WW1 Bentley BR2 rotary engine that is going to be entered in a Model Expo some time in the near future. The workshop has been cleaned up and the model polished in preperation for the photo that is required to go with the Expo entry form (I want to make an early impression on the judges). Note: per the contest rules, all of the geometry and texture maps were created by me. There were no third party models,textures or images used to make this image. Most of the geometry used to make this image was created in Rhino. The rest was made using POVRAY objects. All of the texturing was done using image maps or POVRAY textures. Poseray was used to attach most of the image maps to the Rhino data that had been exported in OBJ format. 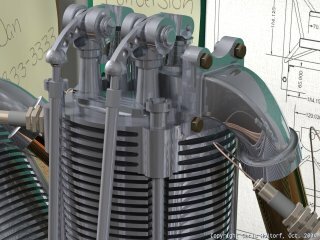 L.K.Blackmore's book, "Bentley BR2", has a complete set of drawings and instructions on how to make a working quarter scale Bentley engine. I used this book to create the various parts of the engine, support stand and propellor. In order to keep the surface meshes high enough in detail for a zoomed in view, I split each part into as small a section as possible. These parts where then rotated around an appropriate axis in POVRAY to assemble the complete object. For example, I only put a quarter of a cylinder into POVRAY and then rotated that around the y-axis to create the remaining three quarters. I then rotated the results around the z-axis to create all nine cylinders. The colors and laminations were chosen to match a photo of a WW1 German two seat fighter that is currently in a British museum. Since quarter scale wood is not available, the wood texturing is that of a full size piece of wood that has been carved into a quarter scale prop. I used Iso Wood POVRAY texturing. All of the textures come from digital photo's of lumber in my garage or shed. The geometry is POVRAY based. Made in Rhino by scanning a real wrench and then tracing over the outline. I added the thickness and thumb wheel to flesh out the rest of the part. The texturing is pure POVRAY. POVRAY geometry and texturing. The metal brackets were created in Rhino using drawings I found on the internet. They use POVRAY texturing. Made from a scanned picture from a co-worker's book. The surface it is attached too was made in Rhino with a high density of control points. The control points were moved about to warp the surface to simulate the look of curved edges, etc. All but one were either scanned or are a digital image that I took and then were placed on a modified Rhino surface to make them look more "used". The drawing in the upper center of the image is supposed to look a little ragged in its' line quality. I use a lot of screen dumps at work and wanted to simulate this for the engine support drawing. I created the drawing in Rhino, did a "print scr" and saved the resulting non-aliased image for the image map. My wife wrote up the text for the three notes to make it look like I was getting too involved in my work and needed some reminders about life outside of the workshop. I scanned the notes and added them to my image map list. The texture for the book cover on the left side of the image comes from scanning the cover of an original P-51 Mustang manual that I own. The green text was added to the cover image using MS Photo Editor, Adobe Photo Elements and my own hand written text that was scanned into the computer. I used the green marker to create the text as I would at work - so that I can't miss it on a cluttered table. Screw drivers were created in Rhino and use POVRAY textures. The plastic box under the table was created in CATIA during lunch one day and uses POVRAY textures. The cardboard tube, box and paint can under the table use Rhino geometry and scans of the box art, paint can label and a large cardboard box for textures. 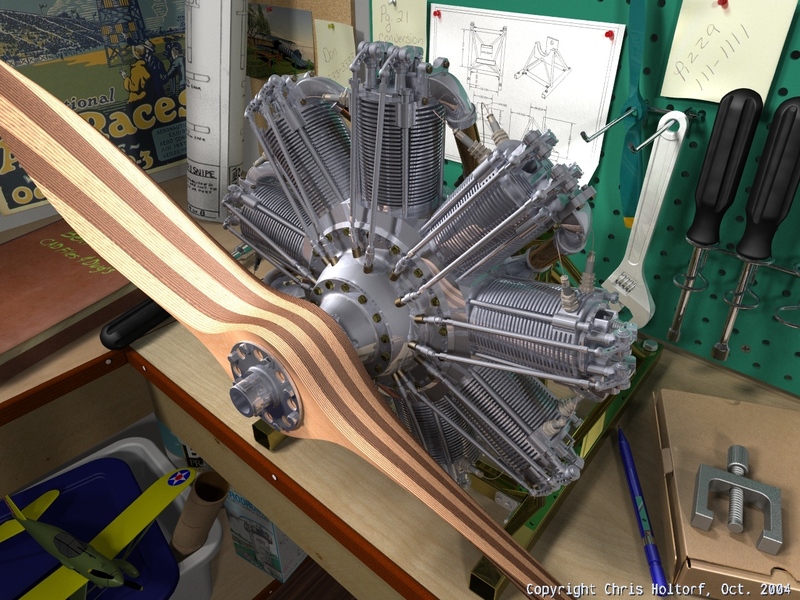 The model airplane in the lower left corner was modeled in Rhino and uses POVRAY textures. 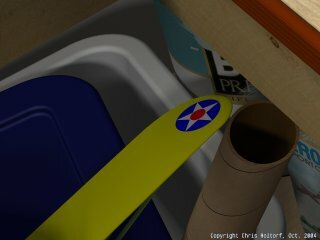 The cardboard box to the right of the engine was created in Rhino and also uses a scanned cardboard texture. The photo pinned to the corkboard is a POVRAY rendered image. Excellent Rhino modelling. I suggest that this picture is sent to the Rhino website for inclusion in the galleries. The lighting is good but could have used some HDRI for added photorealism. Great use of Rhino and POV-ray.